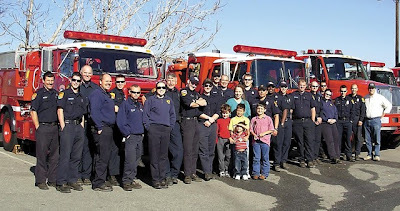 While the staff enjoyed a day off, a local quietly opened its doors on Thanksgiving Day to serve a real, home-cooked meal for a Cal Fire Strike Team stationed in Tehachapi, several hundred miles away from their homes in Humboldt County. “It’s an experience we’ll never forget,” said Battalion Chief Tom Nix, adding, “It’s probably the best service we’ve ever had anywhere,” specifically describing the efforts of the local restaurateurs'’ young children, as they diligently helped to serve the meal. After the meal, which included a birthday cake for one team member, Nix and his team then treated three very excited 10 and 8-year-old boys to a quick ride on a fire engine and a demonstration of the hoses and gadgets on board. Although the family’s 3-year-old watched as older siblings interacted with the firemen, even the youngest had a big impact on the out of town crew. Nix is the father of an infant and a toddler, who are waiting patiently for him back at home. “It really hit home for me,” he said expressing his deep appreciation for the local family’s willingness to open their business and their hearts to those who couldn’t be home with their own families on Thanksgiving Day. Christine Nix, the chief’s wife, said that being apart on the holiday made her even more thankful for the hospitality her husband and his team experienced while in Tehachapi. The Del Norte Unit, from the California Division of Forestry, now known as CalFire, consists of 22 men and five engines, led by Battalion Chief Tom Nix and his strike team leader trainee, Captain Bret Murphey. The team is one of several that have been housed at the Holiday Inn Express recently during times of low humidity, Santa Ana winds and high fire risk. In an effort to help local fire departments during times of high fire danger, currently due to Santa Ana wind conditions, the State of California Office of Emergency Services has deployed Strike Teams” to various parts of Southern California to assist local fire departments during wildland fires and period of high fire risk. The teams assists in structure protection and fire containment and participate in exercises to familiarize the team with the area’s terrain and conditions.